Hot on the tail of Promoted Vee Missions, Empire Avenue is proud to announce Scheduled Missions! Scheduled Missions will allow Mission Creators to set start, and end times for a Vee, or Eaves Mission! Creating a Scheduled Mission is easy! 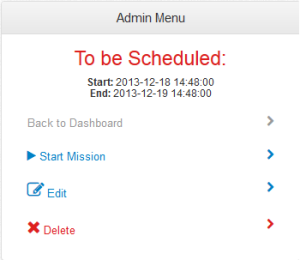 Simply navigate to the Schedule a Mission menu at the bottom of the Mission Creation page. The minimum amount of time a Mission is allowed to run for is 1 hour if using both Start and End Times. Once you have selected your Start and End times for your Mission you can move forward to the Mission Start page and pay for your Scheduled Mission there, or the more prepared people on Empire Avenue can pick up their Scheduled Mission uses right from the Empire Avenue Shop! This is similar to the way that Promoted Missions are handled. An individual Scheduled Mission costs $5 USD, and only $20 USD for 5 Scheduled Missions! Once your Mission is Scheduled you can keep an eye on it in the Missions Dashboard. If your Mission is waiting to go live it will appear as being Scheduled. We hope this new feature will make creating your Missions easier, and more convenient. Take the opportunity now to create a Scheduled Mission and prepare for your busy holiday season!